This article is about death anniversaries in South Asian Sufism. For other uses, see Urs (disambiguation). 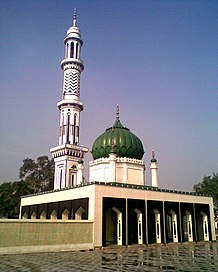 Urs (from Arabic: عرس‎ ‘Urs) or Urus, is the death anniversary of a Sufi saint in South Asia, usually held at the saint's dargah (shrine or tomb). In most Sufi orders such as Naqshbandiyyah, Suhrawardiyya, Chishtiyya, Qadiriyya, etc. the concept of Urs exists and is celebrated with enthusiasm. The devotees refer to their saints as lovers of God, the beloved. Urs rituals are generally performed by the custodians of the shrine or the existing Shaikh of the silsila. The celebration of Urs ranges from Hamd to Naat and in many cases includes the singing of religious music such as qawwali. The celebration also features food samples, bazaar, and various kinds of shops. The Urs of Khwaja Moinuddin Chishti at Dargah Sharif in Ajmer attracts more than 400,000 devotees each year and is regarded as one of the most famous urs festivals around the world. ^ "Another entrance for the Ajmer dargah". Times of India. 29 January 2012. Retrieved 19 February 2012. This article about a South Asia–related topic is a stub. You can help Wikipedia by expanding it.